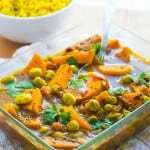 Broad beans curry recipe – a delicious spicy Indian inspired masala curry made with broad beans and simmered down with chunks of sweet potato. I’m not sure I’ve told you guys before but I LOVE cooking with Indian spices. Granted many Indian spices are used in Caribbean cooking due to an amass of south Indians flocking to the Caribbean shores as labourers. However, the range of spices I like to delve into are a complete contrast to what I was accustom to growing up. Every once in a while I like to head off to the groceries and purchase different samples of unfamiliar Asian spices. I have a few staple condiments which I like to fall back on amongst my arsenal of herbs. They are – Cumin (ground and seeds), Turmeric, Ground Coriander, Chilli, Garam Masala, Fenugreek seeds, Mustard seeds, Nigella seeds and Cardamom – to me these are a must have in your spice rack. Of course opinions will vary, but as I previously said, these are just some of my favourite spices. 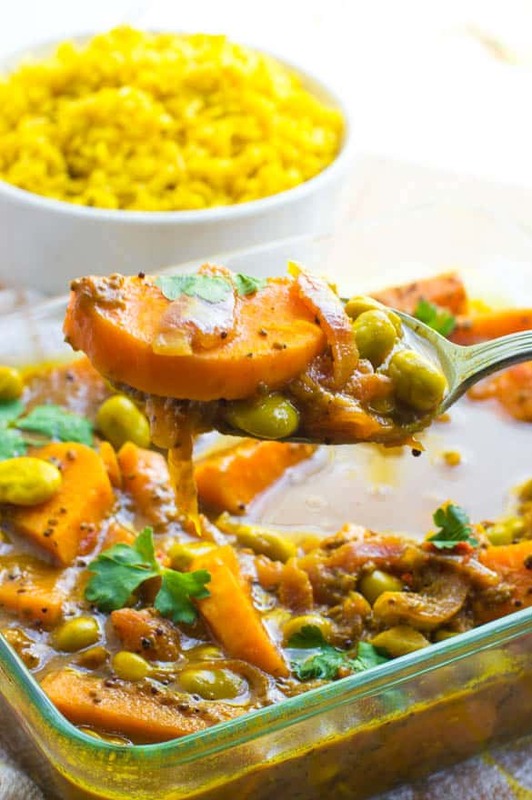 Now onto the broad bean curry recipe, well first of all it’s a spicy vegan curry, there’s always the option of adding some meat but I feel that the sweet potatoes and broad beans are suffice. The broad beans were locally harvested, occasionally a family friend will supply me with some vegetables which is really handy when cooking food from the ground up. Don’t be discouraged by the long laundry list of ingredients, it’s really not as difficult as anticipated. Both prep and cooking time should take no more than 40 minutes maximum and trust me the results are worth it. 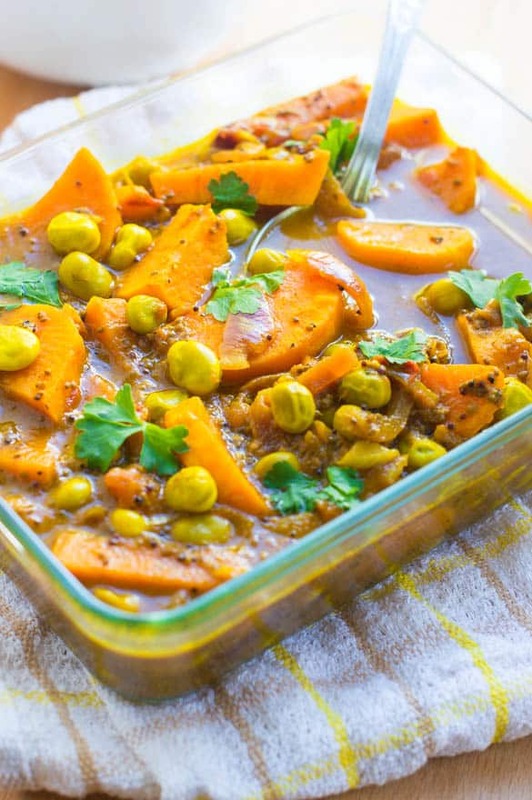 The spices really infuse the sweet potato and broad beans which of course becomes more apparent upon consumption. As with most Indian recipes, we are going to commence with a gentle sautee of the spices, this helps to release their lovely aroma. Your kitchen is going to smell of a wonderful savoury aroma from the board bean curry – don’t complain if the neighbours come knocking on the door with a plate in hand. Start by adding the coconut oil to a non stick frying pan and preheat on low. Allow the chia and mustard seeds to heat through until they begin to crackle. At this point we can add our red onions and garlic, increase the heat to medium, sautéing the ingredients until lightly golden. Now is a good time to add the remaining spices – again sautee everything for a further 3-4 minutes – by now a lovely aroma should permeate the air. Add the broad beans, tomatoes, sweet potatoes and tamarind infused water. Cover frying pan and leave to simmer for 15-20 minutes. Half way through simmering time the sauce will being to thicken. If the water recedes (which is shouldn’t) replenish with 1/4 cup of water. Haha Tekesha, so funny, yes it’s nice to get some free fruit n veg, it cuts down on costs. There’s SO many Indian spices out there and I’m still learning about them too, so no need to feel behind. This looks so good! 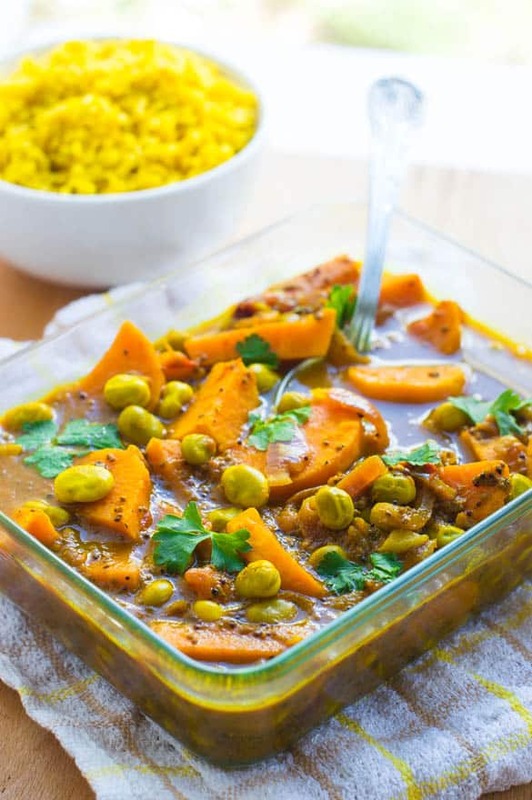 Curry is the favorite menu item around here–will have to try your version! Thanks Caitlin. I eat this almost every week. I love curry also and I hope you do try this one a try. Thanks for the feedback Suzie. Glad you were able to perfect it without the tamarind. I tried your recipe a few days ago, and all I can say is YUMMY! My partner loved it too, will definitely be making this again!